In addition to carrying up to 70 pounds of rocks carefully proportioned in panyards, packgoats at last Saturday’s trail improvement project on lower reaches of Alpine Gulch were among the enthusiastic vegetation trimmers. Thorn, a five-year old Alpine packgoat with proudly arching horn and corresponding beard, contentedly stood by his owner, Marc Warnke of Boise, Idaho, happily munching on an alder bush. Warnke, who designs goat packgear, alludes to the fact these goats are not just pack animals but also beloved family pets. “They’re like golden retrievers with horns,” he says. Warnke’s sibling Alpine goats, Thorn and Merciless, were among upwards of 60 well groomed goats and perhaps 70 proud goat owners taking part in the annual convention of the North American Packgoat Association. This year’s gathering was one of the best attended in recent years in terms of hooved, four-legged goats and their owners, according to association president Charlie Jennings from Willard, Utah. 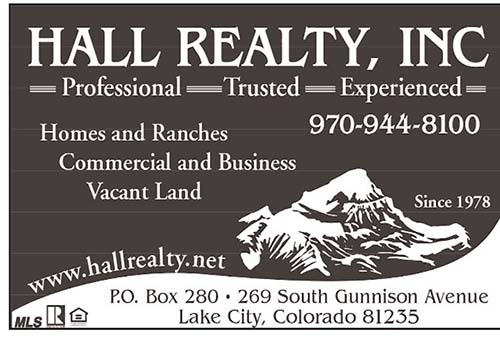 This year’s convention was organized by former Lake City residents Phil and Nan (Inge) Hassey, and was headquartered in Snowden Meadow just above Nellie Creek on Henson Creek. Sleek and inquisitive-eyed Alpine goats were tehered with their bretheren, the slightly smaller-statured — equally bright-eyed, with distinctive with fop ears — Nubian goats throughout the open park adjacent to the historic Pike Snowden Cabin. The assemblage of goats included roughly 35 adolescent kid goats, along with does and bucks. In packgoat nomenclature, an “altered” male is known as a wether. Australia and Hawaii, with a smattering of association members from 10 continental U.S. states, including Colorado, Utah, Wyoming, Washington, Oregon, Idaho, and Minnesota. Meeting at Snowden Park from Thursday, June 15, through Sunday morning, June 18, packgoat association members mixed sociable conversation around the campfire with recreational outings, including seven two-legged humans and seven adult, four-hooved goats, plus two goat kids, on a trek to Uncompahgre Peak. An all-day service project on Saturday improved lower portions of the Alpine Gulch wilderness trail just in time for this weekend’s San Juan Solstice. Solstice runners. During the Saturday, June 17, service project, packgoat volunteers and their owners enthusiastically tackled trimming overgrown vegetation along the trail, as well as the more laborious process of loading rocks into panyards on the goats to fill in badly eroded sections of the trail. At the trail’s first Alpine Gulch stream crossing, the BLM’s Jim Lovelace and packgoat volunteers worked like beavers placing logs across the stream as a temporary crossing. Five-year old Merciless, from Boise, Idaho, took it all in stride, casually stretching his white-furred neck outward toward a particularly tantalizing branch of currant bush. Merciless’ owner, Marc Warnke is an experienced trail runner when not designing custom pack gear for goats. 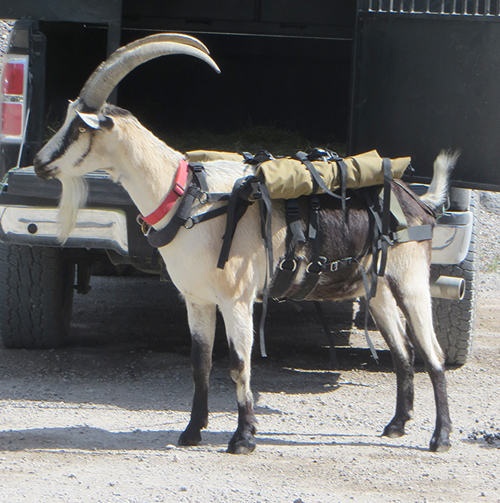 Among his specialties are stoutly designed nylon panyards with loops which fit over the goat’s pack saddle. He explains that he designed the panyards for maximum adaptability in carrying venison, although on Saturday the packs were doing double duty carrying rocks. After each panyard was loaded down with hand-size rocks, Warnke used scale to carefully calculate the weight. Each matching panyard was carefully apportioned with no more than 35-pounds. Merciless and his sibling, Thorn, are five years old and at the peak of a packing life which usually extends from age four to seven. The maximum load for these larger scale Alpine goats, according to Warnke, is 70-lb., evenly divided 35-lb each panyard. With loops and buckled straps properly aligned, Warnke heads off in the lead as Merciless and Thorn amble back up the trail with their rock cargo, Merciless momentarily distracted by the alluring bright green of an alder tree. In addition to their trail improvement work on Alpine Gulch last Saturday, North American Packgoat Assoc.’s gathering included several nights of campfire lectures, the first of which, on June 15, features two experts who have spent their careers studying interaction between Big Horn Sheep and domestic animals, including packgoats. Dr. Maggie Highland, from Pullman, Washington, worked with the USDA on Big Horn Sheep studies. Also addressing the Snowden Park group was John Mionczynski, from Atlantic City, Wyoming, a member of the Big Horn Sheep restroration team who is credited as the founder of the goat packing movement in 1972. 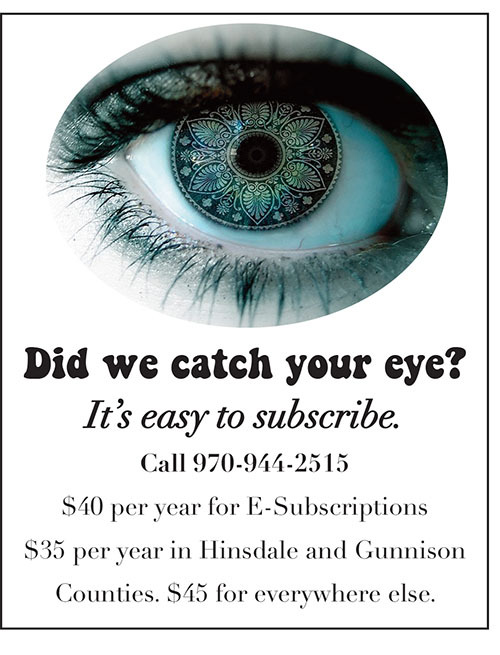 On Friday evening, June 16, Grant Houston of Hinsdale County Historical Society gave a talk on Lake City area history which addressed early day mining, chaaracters such as Pike Snowden, and the various economic booms and busts which the area has experienced over the past 140 years.